Quick tip for ThinkPad owners: the media control keyboard keys located on the arrow keys at the bottom-right corner of the keyboard can be used to control music or other media playing in Windows Media Player (WMP) even when WMP isn't the foreground application! 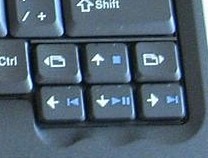 To use these keys, hold down the blue "Fn" key at the bottom-left corner of the keyboard, and press the appropriate arrow key. With these keys, I can have music playing in Windows Media Player in the background (or in a minimized window), and be working in other applications in the foreground. Then, when I get interrupted and want to pause my music (when the phone rings, or when a visitor arrives at my desk), instead of having to open the WMP window and click on the Pause button, I can just quickly push Fn + Play/Pause (the down arrow key), and my music is paused. Another press of Fn + Play/Pause, and my music starts playing again. Quite handy! These two images show the same Windows XP Taskbar with 12 applications running, and a bunch of icons in the system tray. The difference is that in the second image, the Taskbar has been expanded to be two rows high instead of just one. With the increased area available on the Taskbar, it's much easier to read the text that accompanies the icon on each application button, making it a lot easier to find (for example) a specific Firefox window or Word document. The system tray icons are grouped into three rows instead of just one, saving a lot of horizontal real estate on the Taskbar. As a result, there's even more room available for application buttons to be shown. Windows shows the day and date in addition to the time on the right edge of the Taskbar; no need to hover over the time display with the mouse to see that information anymore. Although it isn't shown in the screen cap above, I've found that the bit of empty space below the Start button is a great place to tuck a SlickRun command line into. With the large screen resolutions (and hopefully, multiple monitors) available on modern machines, the additional screen real estate consumed by increasing the Taskbar size to a second row is trivial compared to the usability and productivity gains realized by doing so.